As a Christian-owned fast-food chain, Chick-fil-A has long been known for shining the light of Jesus in their community. From opening their doors for church service on Sunday to opening on the Sabbath to serve food to victims of natural disasters, their employees have gone to great lengths to show they do so much more than serve savory chicken with a smile. They genuinely care for their customers, community, and employees. 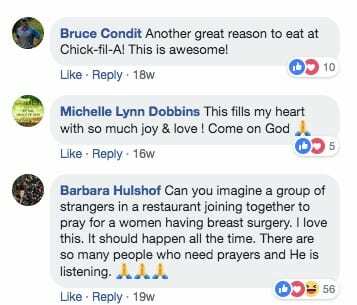 Nothing could have shown that more vividly than a scene recently witnessed at a North Carolina Chick-fil-A where the manager stopped customers and employees alike to lead them in prayer for a co-worker undergoing surgery. Ms. Trish, a beloved co-worker and a “pillar in the community,” was to be starting surgery that day to treat her breast cancer. Her hardship and first step in recovery weighed heavily on the hearts of the Chick-fil-A employees working that day. So the manager on duty made a bold move by asking everyone in the restaurant to stop in the middle of what they were doing — whether that be serving, eating, or waiting in line for food — to pray for Ms. Trish. A witness in the store caught the beautiful moment on camera as every single person stopped in their tracks and bowed their heads during a busy lunch rush hour to pray for this sweet soul undergoing surgery. 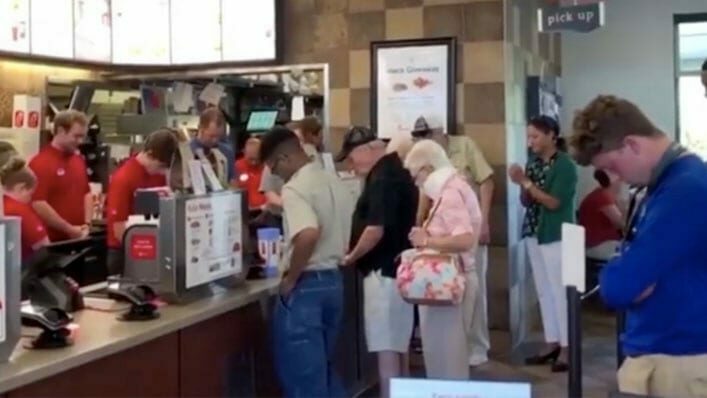 The viral video has swept across the Internet, filling viewers’ hearts with the joy of the Lord, and of course, ONE more reason to eat Chick-fil-A.